Home » Will Mars Colonists Evolve Into This New Kind of Human? Six thousand years isn’t long in evolutionary terms. After all, Homo sapiens has existed as a single species for more than 200,000 years. And some scientists have doubts about Solomon’s timeline. Solomon acknowledged that the path of human evolution on Mars is speculative. But he told MACH in an email that “it follows from what we know about evolutionary biology” that Mars colonists might evolve faster than some think. Evidence suggests that Mars may be devoid of life, and that goes for pathogenic bacteria as well as other life forms. If humans were to establish and live within a germ-free Mars colony, Solomon said, the colonists’ immune systems could eventually lose the ability to fight off infections that might be introduced to the colony by germ-carrying humans or animals visiting from Earth. That risk presumably would encourage the colonists to minimize contact — including sexual contact — with potentially infectious earthlings. That, in turn, could accelerate the pace at which the colonists’ bodies would begin to adapt to their new world. Why would that be? Bones need to work against the force of gravity to stay strong. Gravity on Mars is about 38 percent of that on Earth. Consequently, Mars colonists who start life with beefier skeletons might have a leg up, evolutionarily speaking. The idea is that as their bone density gradually declined in the low-gravity environment, the colonists’ bigger bones might retain enough strength to ward off dangerous fractures. If that sounds far-fetched, consider this: recent research by Mitteröcker and others suggests that the rising popularity of C-sections may be allowing an increase in the size of babies’ heads here on Earth. So Mars colonists might have beefy bones and big heads. Then there’s the question of their eyes. Mars is much farther from the sun than is the Earth, and the extra distance — and the lower levels of sunlight on the Martian surface — could cause changes in the colonists’ eyes. The need to protect those bigger eyes might be another reason the colonists’ skulls might become more robust, Cabrol said, adding that it wasn’t clear whether the changes she envisions would be evidence of a new species or simply a version of Homo sapiens adapted for life in a different environment. Of course, evolutionary changes in humans on Mars would occur only if humans were able to reproduce and successfully raise their children in the low-gravity Martian environment. Cabrol said the colonists might need some sort of “gravity chamber” in which to reproduce and in which their offspring could spend their early developmental years in conditions closer to those on Earth. The Martian atmosphere is thinner than Earth’s, and the red planet has essentially no protective magnetic field. Thus people living on Mars would be exposed to high levels of cancer-causing radiation even if they spent most of their lives indoors. Pigmentation helps block the effects of radiation. The deeper the color, the better the protection. 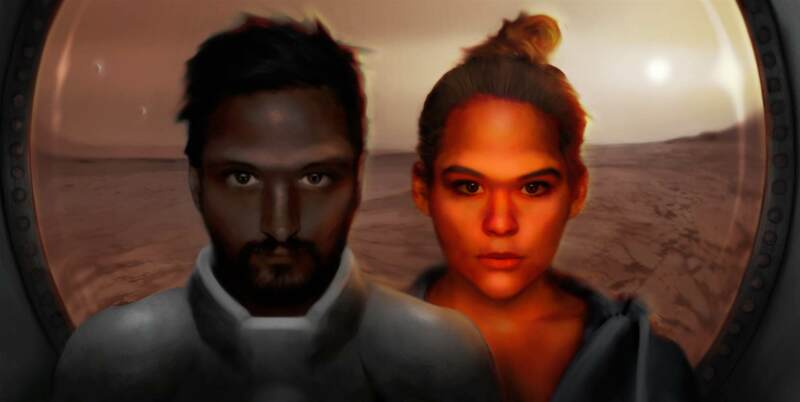 Thus Solomon figures Mars people might evolve to have darker skin than anyone on Earth. Is Solomon right, generally speaking, about the changing appearance of Mars colonists? That’s impossible to say. But no matter what, experts agree that Mars colonists would likely drift away culturally and technologically from their terrestrial ancestors.